As rugged as it is handsome! The Avenger is a heavy-duty scooter designed to handle extra weight, uneven terrain and provide more speed. 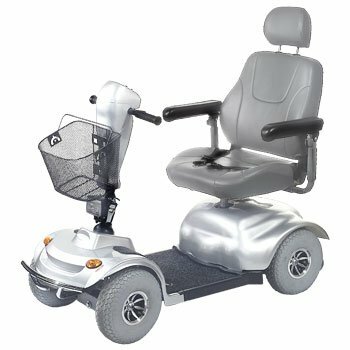 Durable and stylish, the Avenger comes complete with a standard front basket, full lighting package and an extra roomy seat with adjustable head rest. If power is what you need, look no further than the Avenger. Let Golden Technologies take all the worry out of purchasing a scooter. Our skilled technicians integrate the finest components with superior designs to provide you with the utmost quality, comfort, style and performance. We confidently stand behind all our products and provide you with the best warranties in the industry. Choose the scooter that all others are measured against...choose Golden!